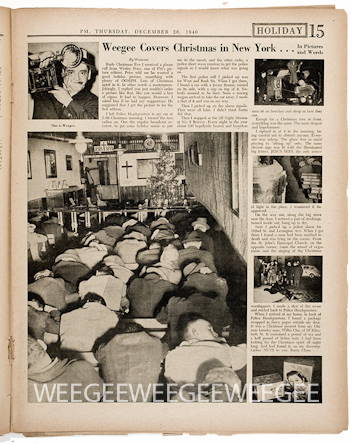 Weegee Covers Christmas in New York… In Words and Pictures PM Daily, December 26, 1940 by Weegee Early Christmas Eve I received a phone call from Wesley Price, one of PM’s picture editors. Price told me he wanted a good holiday picture, something with plenty of OOMPH. Lots of Christmas spirit in it. in other words a masterpiece. Jokingly I replied you just couldn’t order a picture like that, like you would a box of cigars. It had to happen. However, I asked him if he had any suggestions. He suggested that I get the picture in for the first edition. Then I picked up six fire alarm signals. They were alll false. I didn’t think Santa did that. Then I stopped at the All Night Mission at No. 8 Bowery. Every night in the year about 100 hopelessly beaten and homeless men sit on benches and sleep as best they can.